Gleninsheen Wedge Tombs are two tombs with prehistoric importance. While one is intact, the other is partly disintegrated. Both are located in the Burren area. 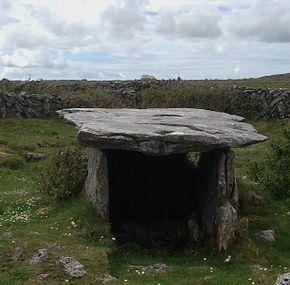 They are one among the eighty sights where such late Neolithic and early Bronze Age tombs have been found. An ornament dating back from 800 to 700 BC was also found here, which is now displayed in the National Museum of Ireland. Almost all such structures that have been discovered seem to face the setting sun at south west, thus, it would seem that this was of significance to the builders at that time. An incredible sight and a must visit, do plan your trip here at the earliest. Personalize your visit to the city by chalking out a plan using Carran trip planner. Add accommodation and hotels in Carran that suit your budget including the most recommended ones like Hydro Hotel, Imperial Hotel, Kinvara Guesthouse and King Thomond Hotel. Draft the best Carran vacation packages using ideal templates offered by TripHobo. Also explore how to reach Carran on the go! Love this? Explore the entire list of places to visit in Carran before you plan your trip. Fancy a good night's sleep after a tiring day? Check out where to stay in Carran and book an accommodation of your choice. Another exciting piece of Ireland's history. This whole area is filled with beautiful places to visit and see. Chiuso al pubblico, raggiungibile scavalcando un muretto.